which can actually encourage bacterial spread. The Fixed Phage technology allows bacteriophages to be immobilised (irreversibly attached) onto food packaging. This stabilises the phages (for > 1 year at room temperature) and allows them to be applied to food products without introducing moisture. Food spoilage occurs throughout the production process and results in significant losses for retailers and manufacturers. The UK Waste & Resources Action Programme (WRAP) reported that £2.6bn/ 1,200,000 tonnes of fresh fruit and vegetables are thrown away per year in the UK. The UN has a goal to “halve per capita global food waste at the retail and consumer level, and reduce food losses along production and supply chains by 2030’’ 1. Processed and bagged salads are susceptible to bacteria spoilage. This is largely mediated by lactic acid bacteria as well as Pseudomonas fluorecens and other closely related organisms. These psychrophilic organisms are capable of growth at low temperatures used to ship and store the final product. Several lytic bacteriophages targeting salad spoilage bacteria were isolated from a variety of sources. Tests were carried out to confirm their effectiveness in killing the bacterial strains of interest and providing protection to the salad leaves. 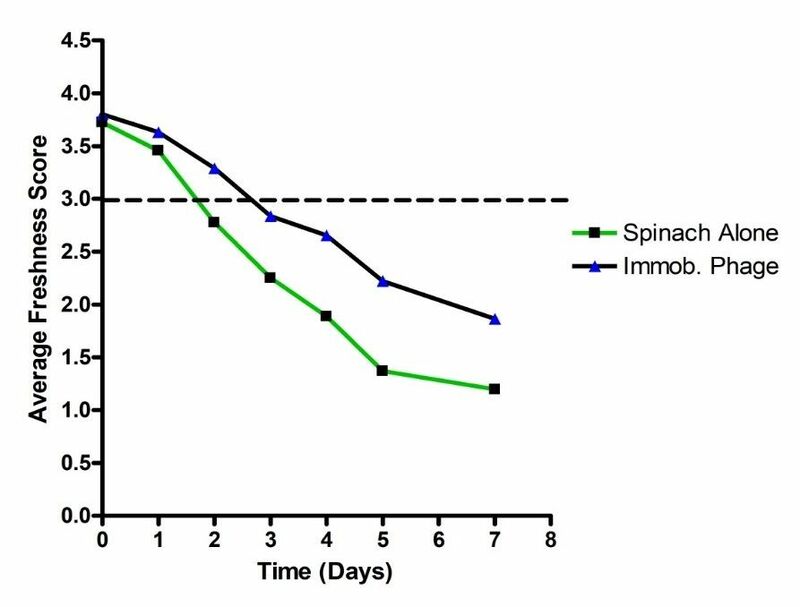 Figure 1: Spinach leaves infected with a P. fluorescens spoilage strain. Leaf A was treated with a bacteriophage exhibiting lytic activity against the spoilage strain, whilst leaf B was left untreated. A phage cocktail consisting of the most effective isolates was constructed. This cocktail was immobilised onto plastic sheets which were inserted into salad bags and used in a shelf life study. Figure 2: Results of a trial conducted using baby spinach leaf bags. The average freshness was recorded daily for untreated spinach bags as well as bags containing a plastic slip of immobilised phage cocktail. A rating of 3 was used as a cut-off point, with scores below this level deemed ‘inedible’. The trial results show a day’s shelf life extension in the bacteriophage-treated salad bags. Further optimisation is expected to result in a greater extension, with further trials currently underway. The application of immobilised bacteriophages presents a novel and effective strategy to extend the shelf life of bagged salads and other food products. The Fixed Phage technology is, in many cases, the most effective and practical way to apply phages to food products.